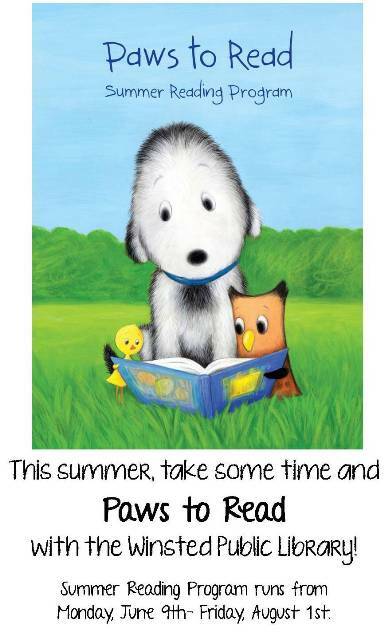 This Summer, Take Some Time and PAWS to Read with the Winsted Library! The Winsted Public Library’s Summer Reading signup starts Monday, May 12, 2014, and offers programs for ages. The program, running from Monday, June 9th-Friday, August 1st, is free and features the opportunity to win prizes. Come in to the library to pick up reading logs and Choose Your Own Adventure reading sheets. Storytime will be Fridays in June and July at 9:30-10:15am at the Mill Reserve Park. In case of bad weather, Storytime will be held at the library. The 3rd Annual Princess Storytime will be on Saturday, July 19th at 1pm. Ages 5-11 will PAWS to Read this year as they keep track of their reading times each day, starting Monday, June 9th. Bringing their reading logs into the library once a week will earn them a weekly prize and a raffle ticket that they can put into the weekly raffle of their choice. To promote the PAWS to Read theme, the Winsted Library plans to have a box of stuffed animals that the summer reading participants can adopt as a reading buddy. Teens and adults are invited to ‘Choose Their Own Adventure’ again this summer, and can begin reading as soon as they sign up. The ‘Choose Your Own Adventure’ reading program has been popular in the past, but this year, there will be a new twist to it. There are 20 categories to choose from, and the readers can pick which ones they want to read, and in what order. The Winsted Library will also be sponsoring a pet photography contest for summer readers to submit their best picture of their pets. There will be different categories, such as funniest, cutest, and best image that will be awarded prizes. The Winsted Wildcats baseball team and the Winsted Library are teaming up this summer as well. The Storytime kids and readers ages 5-11 will get to attend a Wildcats home game (yet to be chosen) and meet some of the Wildcats players. Once again the Winsted Public Library and the McLeod County 4-H are combining to present two free hands-on programs for area children. The June 19th program will feature Junk Drawer Robotics, and the July 24th program will be about building simple Rube-Goldberg machines. Both programs will be from 9:30-11am at the Winsted Library. During Winsted’s Summer Festival, everyone is invited to come watch Escape Artist and Magician Karl Achilles at Hainlin Park, as he performs his amazing show filled with magic and mystique. This program is presented and funded by the Winsted Library, the Winsted Library Commission, and the Minnesota State Legacy Fund. the Winsted Library at 485-3909.